Get 4 of our most popular training sessions for one GREAT price. This video training offers insights into why some brands thrive and create 7-figure revenue while others struggle to stay afloat. This 20 minute video covers visual brand basics, the benefits of media coverage and how social media plays a part in growing your brand footprint. 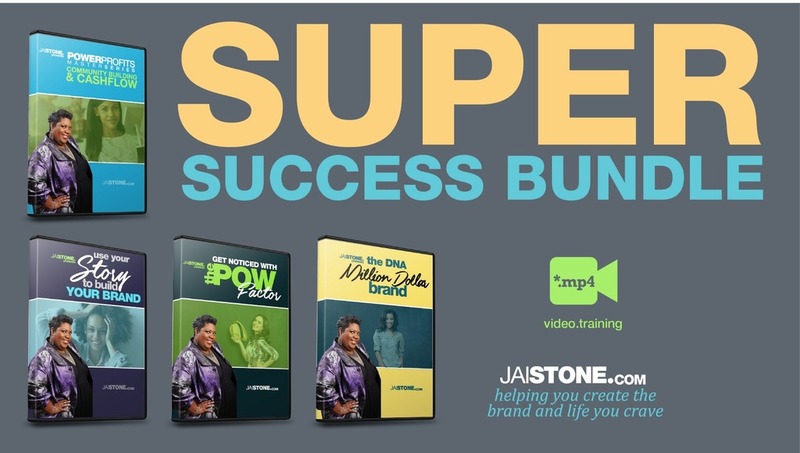 This 20 minute video takes you on a step by step guided journey on some of the most icon pop culture personalities like Oprah Winfrey and Will Smith. The training breaks down the things that keep them attractive to the media. Jai Stone refers to it as the POW Factor! This video is a replay of a live training webinar. In it you will discover how to extract your personal story and use it to grow your brand. Learn how to attract media coverage and paying clients by sharing your authentic journey through life. In this 2-part training you will learn the benefits of building and online community and how it affects the revenue in your business. Master Brand Coach, Jai Stone shares strategies for building a devout online following and cashing in on the community loyalty. This is a recording of a live training event complete with Q & A.